Hoge prestaties, lage kosten, en een grote capaciteit. 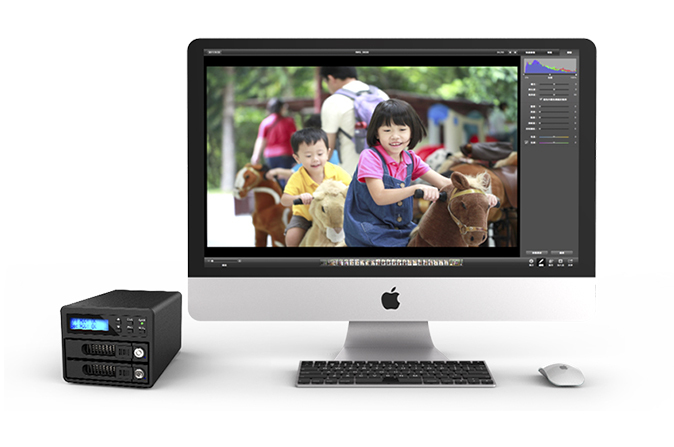 Dit RAID-systeem is perfect geschikt voor high definition video/audio post-production workflows. De GR3680 is speciaal ontworpen voor professionele content creatie toepassingen en is voorzien van high-speed interfaces, zoals USB 3.0 en e-SATA poorten. De GR3680 ondersteunt twee 6Gbit/ 3Gbit drives (max 8TB per schijf, totaal 16TB). Up to SATA 6Gbps, The Cost Effective RAID Storage. High performance, low cost, large capacity supported RAID system for high definition Video/Audio post-production workflows. Supports multiple HD Video/Audio streams, GR3680-SB3 is designed specifically for professional content creation applications and features high-speed interfaces including USB3.0 (5G) and e-SATA (6G) ports. Configure, setup and monitor system status via front panel LCD without installing any software. 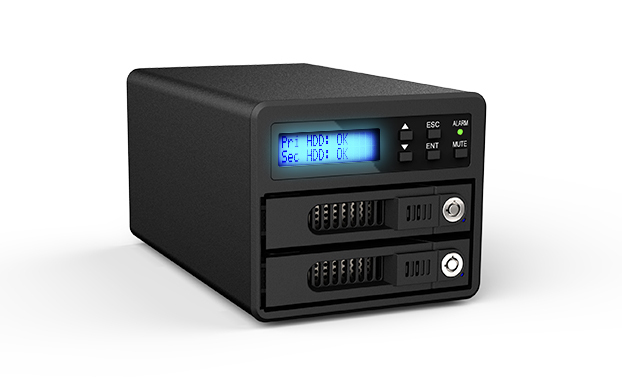 GR3680 is ready to use right out of the box to start protecting your data or enhance your digital content creation workflow. 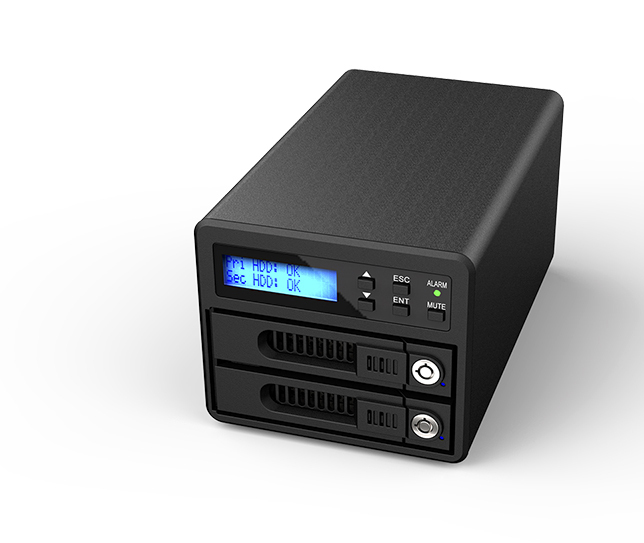 The GR3680 supports two 8 TB (6Gbit / 3Gbit) drives to store more, back up and protect space intensive project files. When connected to a SuperSpeed USB 3.0 port, GR3680 lets you access and save files up to 10 times faster than USB 2.0. *Performance may vary based on user's hardware and system configuration. GR3680-SB3’s drive module is built-in with locking mechanism to prevent from accidently removing hard drives. In the event hard drive should fail, simply swap out the defective drive with the same drive module to shorten the downtime and reduce the cost of repair. 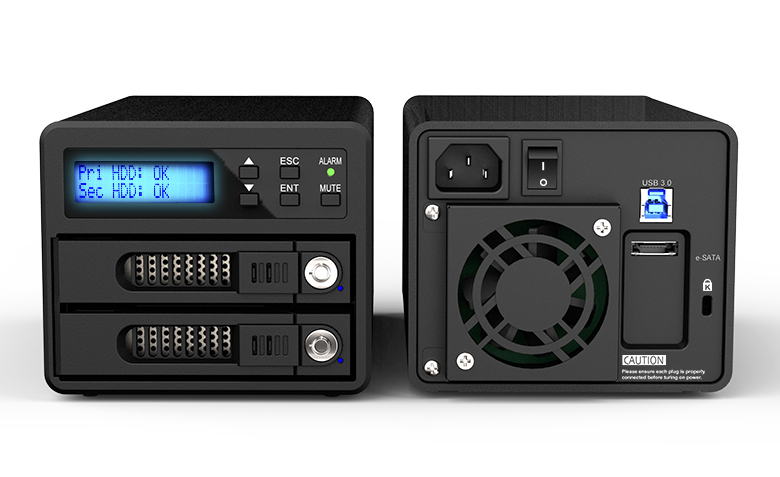 GR3680-SB3 uses an industry standard power cord and professional quality internal power supply for the most efficient and reliable power source possible. Ideal for Apple ProRes HD offline editing on a iMac. High reliable RAID 1 (Mirrored) offers ultimate protection beyond RAID level . All data are written simultaneously to both drives. If one drive should fail, your data is still accessible and the second drive will take over. Do you remember all the wonderful family gatherings? Do you know that not even one single element captured in any picture can be replicated? All the photos gathered in the past are key assets throughout your life. It’s not a tough job to protect these digital photos. Whether you are just an iPhoto® user or a professional photographer running Aperture®, you can transfer your photo library into a GR3680-SB3 device and let GR3680-SB3 protect your beautiful time and memory. High performance RAID 0 ( Striped ) yields the speed you need for smooth video editing, rendering complex 3D objects or special effects in ultra high speed.